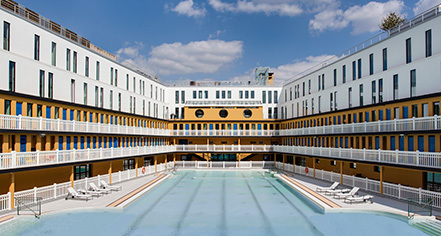 Nestled in the 16th arrondissement of Paris, the Hôtel Molitor Paris - MGallery by Sofitel opened as an Art Deco swimming pool and sports complex in 1929. During its heyday, it was a popular attraction for the socialites of Paris. When the bathhouse closed in 1989, it was taken over by street artists who created their own open-air artist’s studio, using every surface of the property as a canvas. Today, this boutique hotel offers a quirky personality and a remarkable experience to all who visit. The soul of the hotel expresses itself through the creative, Art Deco-inspired décor. The Hôtel Molitor Paris offers a creative and exciting atmosphere for all who stay in its 124 luxurious guestrooms and suites. Guests will find the ultimate amenities for relaxation at this spa-focused resort in the heart of Paris. Activities abound on the hotel’s own property - guests can swim in the historic, 1930s pool, relax in the Spa by Clarins, visit the sauna and hammam, or take a private lesson with one of the fitness coaches. This unique hotel also offers the Brasserie Urbain Molitor and Le Toit-Terrasse, which boast exquisite French cuisine, light bites, and delightful cocktails. 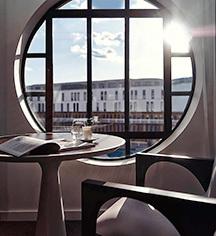 The historic Art Deco Hôtel Molitor Paris is a unique city resort with a relaxing atmosphere. Guests will be able to walk to many popular tourist destinations including the Roland Garros, Jean-Bouin, and Parc des Princes stadiums, as well as the sprawling Bois de Boulogne park. Hôtel Molitor Paris - MGallery by Sofitel, a member of Historic Hotels Worldwide since 2018, dates back to 1929. Hôtel Molitor Paris has the largest street art collection in the world, located around the pools and in secret corners of the hotel. Early Check-In/Late Check-Out: Available for a fee, depending upon availability. Hotel/Resort Fees & Taxes: A tax of €3.3 per adult over 18, per night is required by the city. Parking: On-site valet parking is available; €35 per night fee applies. Pet Policy: €10 per pet, per night. Nestled in the 16th arrondissement of Paris, the Hôtel Molitor Paris - MGallery by Sofitel opened as an Art Deco swimming pool and sports complex in 1929. During its heyday, it was a popular attraction for the socialites of Paris. Learn more about the History of Hôtel Molitor Paris - MGallery by Sofitel .